This has been one of those weeks where I should have scheduled activities differently if I wanted school to be a priority. That's not to say we entirely blew off school this week, but only half of what I'd hoped to accomplish happened. Some of the events this week were out of my control while others were scheduled by me or with my input and I still overbooked Amber. To be fair though, I scheduled it all in pieces and each addition didn't seem like too much at the time. I'm still learning... still. We probably would have done better if Sunday had not started poorly with another missed day at church. 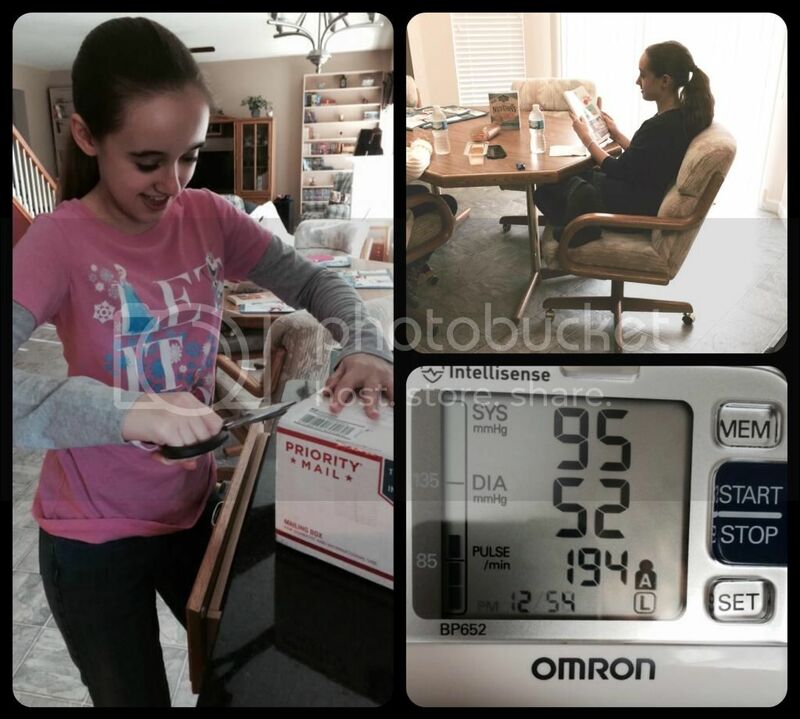 Amber woke up Saturday night / early Sunday morning with her heart in tachycardia. It was so fast that it awoke her; she was scared and exhausted. I got her back to sleep in our bed, but then I couldn't sleep and kept checking her. She remained in tachycardia even while asleep. It wasn't until she was awake for the day and I was able to give her a dose of midodrine that her heart calmed down some. 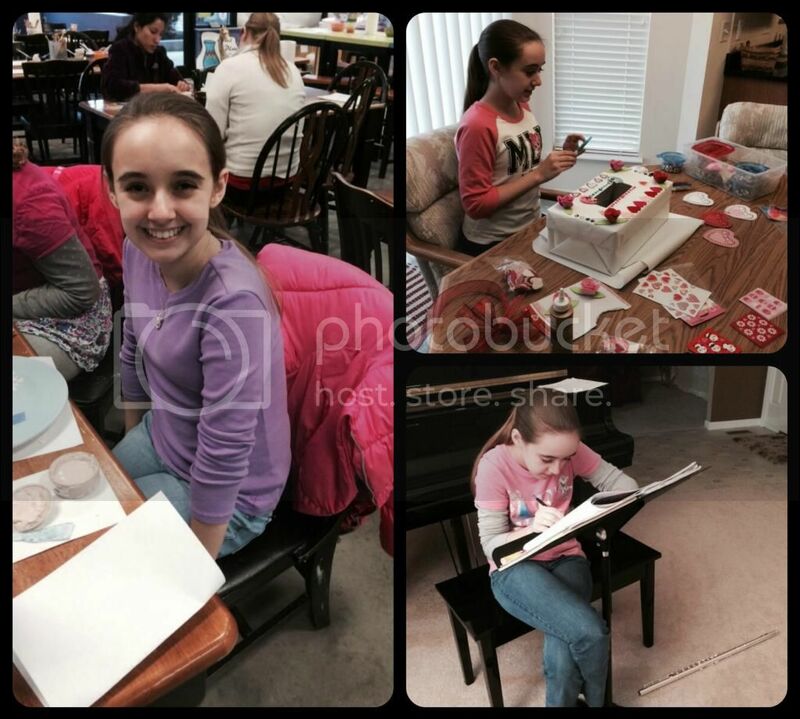 The whole day was mostly a bust, except for decorating her Valentine's box and cards for friends. Opening a surprise gift from my aunt and uncle; American Girl Magazine quiz with a friend; and a very problematic reading considering she had taken her medication. This meant we were playing catchup in the energy department on Monday, but I had lessons planned for the morning before we went bowling with the homeschool teen group. Only history reading happened Monday and that was at the allergist on the way to bowling. Of course the bowling (and laser tag... I gave in) was too much, so Amber crashed Monday evening. Tuesday was a very slow start while still ending up to be the only real productive school day. Fred and Amber wanted to see The Seventh Son and we originally planned to go Sunday evening, then we tried for Monday evening. Eventually we finally made it on Tuesday evening. The movie was enjoyable, but disappointing to Amber. It did not follow the books closely at all and she is a fan of the book series. We ended up seeing it in 3D at a theater, while equally close, is not our normal venue. I'm not sure if it was the theater or the movie itself, but the 3D was quite blurry. Not like if you don't have your 3D glasses on, but like it was out of focus or you were viewing it through a film of water. This detracted from the film a great deal. I wish there had been a convenient 2D time for the movie at our normal location. Wednesday was Amber's regular flute lesson and a much anticipated get-together with her best friend for the friend's 13th birthday. The girls went to the Painted Pot for creative fun. Of course we also had co-op classes Thursday, for which I was cutting it dreadfully close in being prepared. I'm definitely looking forward to our upcoming break week soon. I need some time to recharge. I probably will only teach German next year, if there is interest in the language. I'm finding it hard to prepare for both older and younger age groups weekly. I know lots of others do it, but my brain isn't wanting to switch gears. It's like I can connect with only one age group a week. Creative times. Painted Pot, working on her Valentine's box, and music. Er-hmm. Do you see where the flute is? The flute also had regular maintenance this week. Now today we have the homeschool Valentine's party with around 100 kids that have RSVPed. Seriously, these homeschooled kids are at such a social disadvantage. They never get to be around other children. And if you believe that, did you read the above schedule we had this week? Today is the third time in one week we are with the homeschool group kids. As for the actual school lessons that occurred at our house this week, well those were often not the ones I originally planned. Amber did complete math three times this week, which I consider a huge win considering the time available. She continued with Cover Story and a review lesson for Analytical Grammar. Now she doesn't have grammar again for another two weeks. Science is moving along quickly still and I'm going to need to order Chemistry for Amber sooner than I thought. That's still a wonderful thing. History really was only reading with one passage outline, which is fine as well. She is currently scheduled to finish her history lessons about a month early, so we have time to dawdle. German made progress this week too, however I'm not sure it's important for Amber to keep pace with my co-op class anymore. If she is on their schedule it means her German lessons for the year will be over in April and there is really no need for her to rush through to finish early. Recently, we've also been working with several items for the Review Crew as supplements to our normal studies. Eventually I'll post reviews for those items, but I must say they are helping us tremendously by providing alternate learning methods on some of our rougher days. At the Valentine's Party. 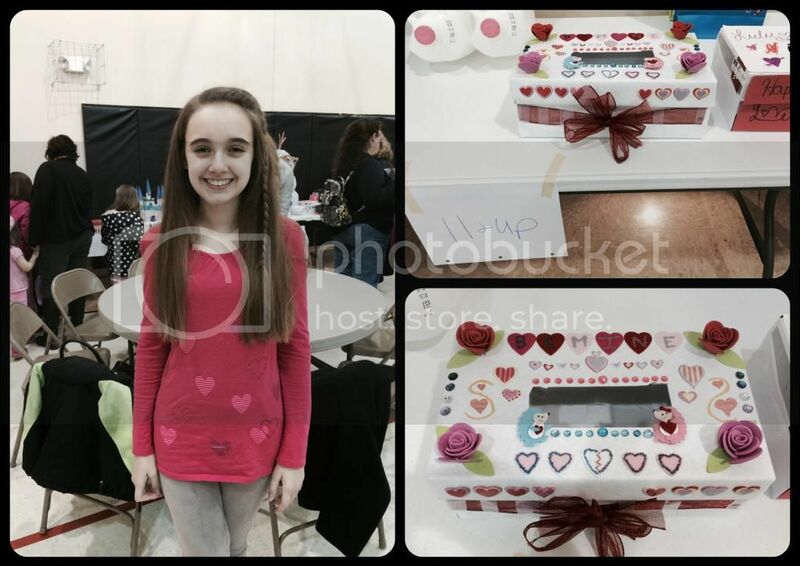 Amber's box won "Pretty's Valentine's Box" in her age group. My iPhone pictures do not do it justice. Nor can you see see the jewels clearly, or the glitter on all the felt hearts. I know this weekend is Valentine's Day, and this doesn't seem terribly appropriate, but I really just want my house deep cleaned this weekend. That's all. I need to bake a few things for Amber and I need more than superficial cleaning. So, if the family would pitch in and do some work then that would be a wonderful present for me. I hope you get your home deep cleaned. It sounds like a great week to me. You are doing a great job under such extreme issues. I hope you all have a wonderful Valentine's weekend. I'm so with you on the clean house! Don't give me chocolate or flowers! Do my dishes and laundry and vacuuming...and scrub the toilets! :D And maybe bring me a hot drink...It's amazing how much Amber (and you) get done each week despite her fatigue. Definitely full weeks of learning and socializing! I'm sorry that Amber didn't start the week feeling well. We are continuing to pray for you all Christy. I love her Valentine's box. And 100 kids! Yes poor, unsocialized homeschoolers. ;) And you got WAY more work accomplished than we did. This was one of those 'we have something everyday' weeks. Happy weekend! That heart episode must have been scary for everyone. I think sometimes the priority is just spending lots of time enjoying friends and participating in social activities! But still, you did pack in quite a bit of learning! I hope you get your Valentine wish! I do hope you got your Valentine wish for a clean house. It's funny what makes us feel loved, but I'm the same - my lovely mil cleaned my fridge for me whilst she was here on holiday - honestly, she couldn't have done anything I appreciated more! You both got done waaaay more than we did this week! You are both doing a great job under very difficult circumstances.